Can an Hypothyroidism/Underactive Thyroid Be Cured? Home » Informational Posts » Can Hypothyroidism Be Cured? The topic of whether hypothyroidism can be ‘cured’ comes up a lot. The quick answer is yes, it can be cured. However, the important thing to be aware of is that for most, it’s not curable. It’s down to the cause for your hypothyroidism in the first place. Around 90% of us with hypothyroidism, have the autoimmune disease Hashimoto’s Thyroiditis, causing our underactive thyroid (hypothyroidism). That’s 90% of you reading this. Many of those with it don’t even know! Hashimoto’s causes the body to attack and destroy its own thyroid gland, causing hypothyroidism. You can find out if you have Hashimoto’s by having the two thyroid antibody tests done – TPOAB and TGAB. You need both to be done, as often just the one test is not accurate enough to be sure. One could have results ‘in range’, while the other not. A high result in either diagnoses Hashimoto’s. Now, autoimmune thyroid disease can’t be cured, but many functional doctors as well as Thyroid Pharmacist Izabella Wentz, say that it can be put into remission. And as of February 2019, mine is in remission. You may find online influencers or those on social media claiming that they ‘cured’ their Hashimoto’s, but this isn’t possible. Autoimmune hypothyroidism, Hashimoto’s, stays with you for life. There is no way to cure yourself of it. You can manage it and/or put it into remission but you’ll always have it. 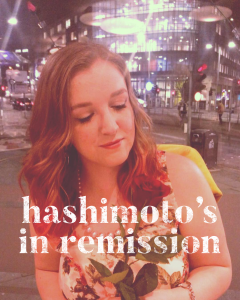 Simply put, ‘remission’ means that the Hashimoto’s becomes very well controlled, with lowered to zero antibodies, and for some people, they don’t even need thyroid medication any more. They can manage their autoimmune thyroid disease through diet and lifestyle and halt the progression of it (Izabella Wentz’s book explains this in great detail). Though I must stress that it seems somewhat rare. Dr. Datis Kharrazian explained in his book that you would need to catch the Hashimoto’s before it had destroyed much thyroid function, to be able to live without thyroid hormone replacement. Catching and halting it before you probably even have many symptoms. Can Non-Autoimmune Hypothyroidism Be Cured? The other 10% of people with hypothyroidism, who don’t have Hashimoto’s, can ‘theoretically’ cure their hypothyroidism. It’s not very common but could be done. By removing or ‘fixing’ this issue, the hypothyroidism could theoretically be cured. For others, they can’t fix their non-autoimmune cause for hypothyroidism, e.g. a problem with the pituitary gland which can interfere with thyroid hormone production, or a thyroidectomy which can include all or some of the thyroid gland being removed, thus preventing the right amount of thyroid hormone needed, being produced naturally (without thyroid hormone replacement). For many though, they don’t know what’s causing their non-autoimmune hypothyroidism. It’s also worth noting that apparently 10-15% of those with Hashimoto’s do not show up on the antibody tests. I.e. it comes back negative, even though they do have it. 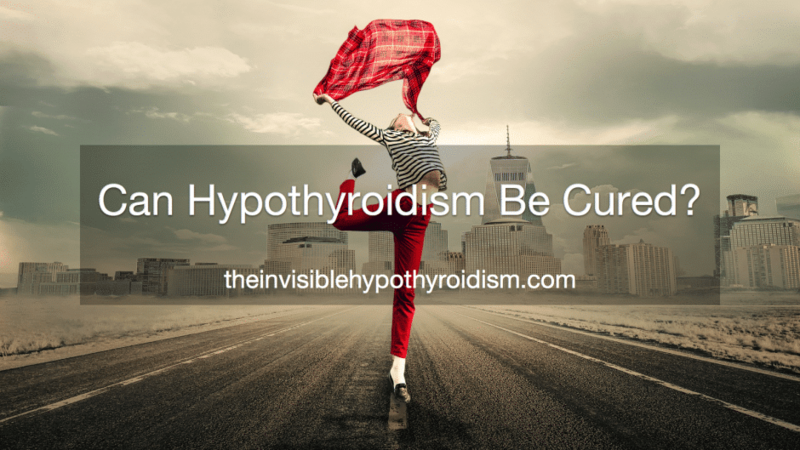 So yes, hypothyroidism can be ‘cured’, just not very often and not for most of us. For most of us, it’s much more beneficial to look at managing our hypothyroidism as best we can, without focusing too much on ‘getting off of meds’ or ‘finding a cure’. Thyroid hormone replacement is to us as food and water is a regular, healthy person. We need it to survive. Next Are You Taking Your Thyroid Medication Properly?